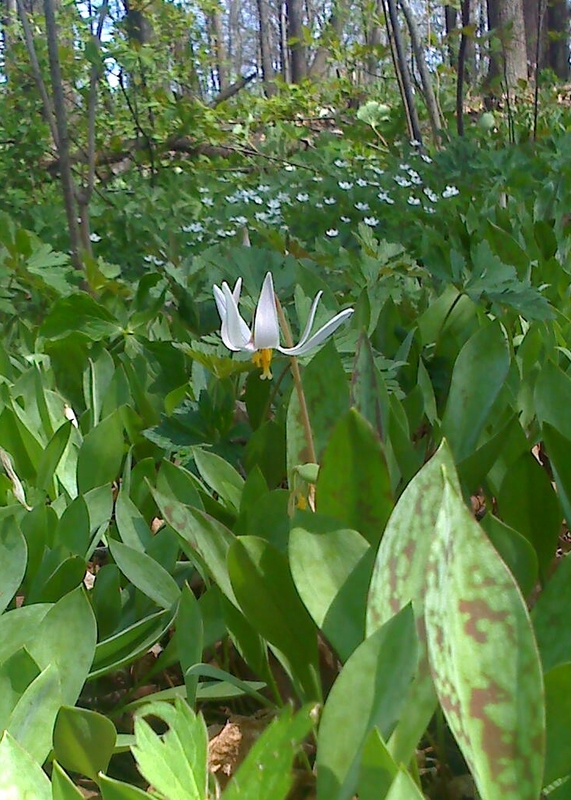 Are there endangered dwarf trout lilies in the Arb? Lance and I went for a hike in Big Woods State Park about a week ago, and the dwarf trout lilies were in bloom. After reading a bit about them (here’s the U.S. Fish & Wildlife Service fact sheet) I wondered if there might be some in the Arb or down along the river. Apparently the dwarf form of the trout lily is ONLY found in three counties in Minnesota, and nowhere else in the world. The foliage of the dwarf trout lilies and the regular trout lilies looks the same and they are found together in the same drifts, so you can’t tell them apart until they bloom. Trout lilies have six creamy-white tepals (that was a new one for me) and the flower is about the diameter of a nickel. Dwarf trout lilies have 4, 5, or 6 tepals and are about the size of a dime. They also have a slightly pinkish cast. I went into the Arb and found some trout lilies, but only a few were blooming, and I didn’t see any recognizable dwarf trout lilies. Does anyone know if the dwarf version has been identified in or around Northfield and/or the Arb? Here are some more details from the MinnesotaWildflowers blog/website. I haven’t seen them in the ARt, Tracy, but there is a nice crop along the river at the River Bend Nature Center in Faribault. Oops – ARB, that is! I have lots of regular Trout Lilies out at my home at Circle Lake, none of the dwarf variety though. We had to check on that prior to building my home as the dwarf variety is protected (hope you didn’t pick any of em to bring home…). No, I was a good girl and only took photographs, no cuttings! I know there are some along the Little Cannon River near Cannon Falls but have not seen any in the Arb. They are so tiny and very hard to find. Thanks for bringing these gems to the public’s attention! Thanks for the comment, Beth. Does the CRWP have any particular info about the dwarf trout lilies, reports of sightings, anything like that? Nothing recent that I know of. The Nature Conservancy owns some land in Rice County that is protected for the Dwarfs. Not open to the public so as to keep them safe I guess.